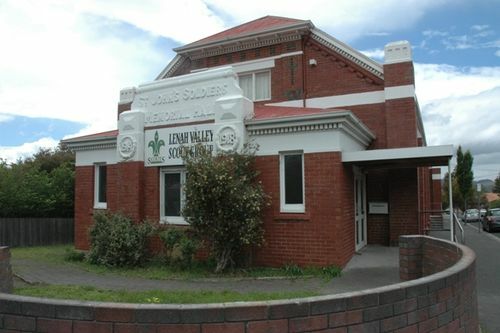 St John`s Soldiers Memorial Hall commemorates those who served in World War One. The foundation stone for the hall was laid by the Bishop on the 23rd June 1929. The foundation stone of St. John's Memorial Hall, New Town, was laid yesterday in the presence of a very large gathering by the Bishop (the Right Rev. Dr. R. S. Hay), who, with the rector (the Rev. C. H. Corvan), conducted the service. The hymns were accompanied by the Derwent Concert Band under Mr. T. W. Hopkins. The building, designed by Mr. R. W Koch, F.R.V.I.A., is to be of brick, with stone foundations and cement dressings. It will hold a parish hall 65 x 33 feet, with a stage, 33 x 20 feet, and at the back a kindergarten-room 32 x 20 feet, with dressing-room, kitchen, and other conveniences. The builder is Mr. N. H. Jensen, with whom is associated Mr. W. M. Fyle. As a souvenir of the stone-laying Mr. Koch handed to the Bishop a blackwood mallet bearing a silver plate suitably inscribed. The Mercury (Hobart), 24 June 1929.